Members of the Illinois House of Representatives recognized the 100th Anniversary of the Dixon Memorial Arch last week through an honorary resolution. The arch, also known as the “Victory Arch,” was built in May of 1919 to honor returning Lee County servicemen, and while it was originally constructed as a temporary structure made of wood, the arch was reinforced and made a permanent structure in 1924. It was rebuilt several times throughout the years, and was ultimately torn down and reconstructed as a fiberglass arch. The current structure, which accommodates the four-lane road that runs underneath it, was dedicated during Dixon’s Veterans Day celebration in 1985. 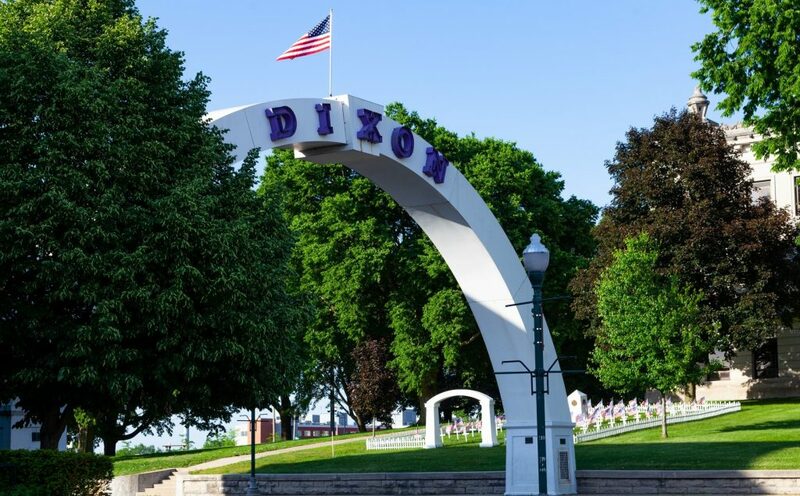 The arch greets all visitors to Dixon and welcomes travelers to the downtown area. It is a mainstay of the city, and I was proud to sponsor a resolution that pays tribute to such an important part of Dixon’s history. Those interested in learning more about the history of the arch are invited to attend a Founders Day Program on Thursday, April 11 at the Northwest Territory Historic Center, 205 W. 5th Street in Dixon. Doors open at 6:00 PM, and the program, given by local historian Duane Paulsen, begins at 6:30 PM. The photo above is the work of 90th District resident Steve Pritchard, who was one of the winners of my 2019 “Rich History of the 90th District” photo contest. Final preparations are being made for a joint Town Hall Meeting I will host on Tuesday April 23 in DeKalb with State Senator Dave Syverson (R-Rockford) and State Representative Jeff Keicher (R-Sycamore). The 7:00 PM – 8:30 PM event will be held at the DeKalb County Community Outreach Building, located at 2500 North Annie Glidden Road in DeKalb. The Town Hall Meeting will feature a presentation on the state budget and the current graduated income tax proposal, followed by a question-and-answer period moderated by Eric Olson, General Manager of the Daily Chronicle. Attendees will be encouraged to submit questions on notecards that will be circulated throughout the presentation and discussion. For questions or more information, please contact my office at (815) 561-3690 or visit tomdemmer.org. The 90th District is home to Whiskey Acres Distilling Company in DeKalb and Kennay Farms Distilling in Rochelle, and legislation I passed last week would allow these business owners to grow and thrive without being subject to overly-burdensome regulations. HB 2675 would provide craft distillers with many of the same benefits afforded to craft brewers and wine makers. It would ease regulations to help these small businesses get started so they can thrive. Specifically, HB 2675 amends the Liquor Control Act and splits the existing craft distiller license into two classes dependent upon the volume of spirits manufactured each year. It also provides a process by which those who produce less than 5,000 gallons of spirits per year can apply for an exemption to self-distribute their product. 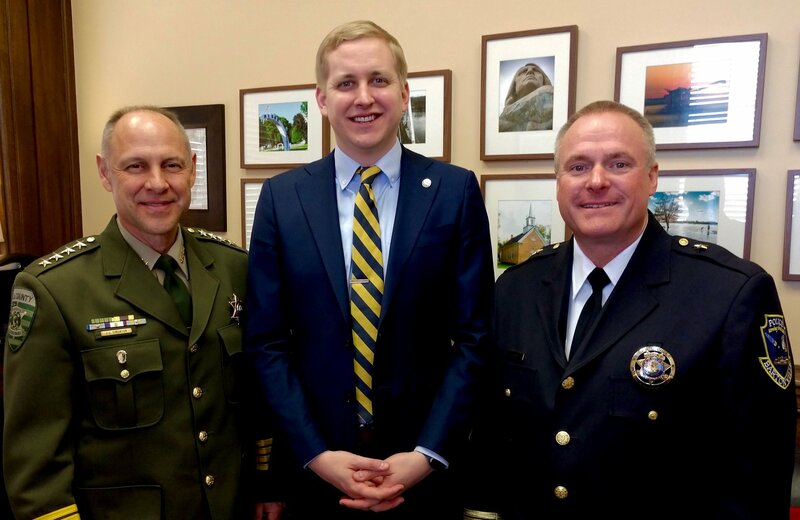 Last week I had an opportunity to meet with Lee County Sheriff John Simonton and other law enforcement officials to discuss the Fight Crime: Invest in Kids program. This organization is a bipartisan membership organization of more than 350 Illinois police chiefs, sheriffs, state’s attorneys, leaders of police officer organizations, and crime survivors from throughout Illinois who believe that the best way to fight crime is to help kids get the right start in life. Ten advocates from the organization visited Springfield and spoke to lawmakers about how their programs can also help get troubled children back on track. On April 10 it was a pleasure to speak to representatives of the Illinois State Alliance of YMCAs about the state budget. I was surprised and honored to receive their Legislative Champion Award, which was presented by Andrew McFarlane of the Dixon Family YMCA. Attacks against state workers who protect our most vulnerable are unfortunately common – with more than a dozen attacks taking place since 2013. After an almost two year-long journey, legislation sponsored by Rep. Tony McCombie to extend protections to DCFS and Adult Protective Services workers in honor of slain-DCFS worker Pam Knight, received the unanimous approval of the Illinois House of Representatives. HB 1482 adds protections to DCFS and Adult Protective Service employees from assault, the same protections applied to teachers, police/fire, and other emergency responders who protect those in harm’s way. This legislation essentially closes a loophole in the law that omitted DCFS and Department of Aging workers from those harsher penalties that are applied when other public servants are attacked. HB 1482 will now move to the Illinois State Senate for consideration where Senator Brian Stewart has pre-filed to sponsor the legislation. Scott’s Law, the Illinois state law named in honor of a fallen first responder that requires motorists to move over when they see a parked first-responder vehicle, is getting more support from law enforcement and highway officers all over Illinois. Scott’s Law specifies first-responder vehicles that are displaying flashing lights of any color – red, blue, amber, or yellow. When they see the flashing lights, drivers are legally required to proceed with due caution, reduce the speed of their vehicle, maintain a safe speed for road conditions, and – of special importance – make a lane change, if possible, into a lane not adjacent to the parked first-responder vehicle. If the driver cannot safely change lanes because of other traffic, the driver must pass the first-responder vehicle very slowly. Last week a large group from the Illinois Association of Court Clerks (IACC) was in Springfield for their Legislative Action Day. Representative Andrew Chesney and I met with Circuit Court Clerks from throughout northwestern Illinois, including Ogle County Circuit Clerk Kim Stahl. The report on March 2019 State of Illinois cash flows, including “general funds” cash flows, was compiled by the Commission on Government Forecasting and Accountability (COGFA), the nonpartisan budget-monitoring arm of the Illinois General Assembly. COGFA continues to find mildly positive State of Illinois cash-flow numbers. These figures reflect the taxes paid into the State of Illinois, particularly personal income taxes, corporate income taxes, and sales taxes. These three taxes are key generators of money for the “general funds” that carry most of the load of Illinois school aid, prison operations, and other day-to-day requirements of state responsibility. With respect to March 2019, for accounting purposes a key set of comparisons group each line item with the corresponding line item for the previous year. On a year-over-year basis, in March 2019 personal income tax receipts rose $165 million and sales tax receipts rose $63 million. While corporate income tax receipts fell during the same period by $1 million, these signs of strength in two key revenue areas helped lead to an overall increase in State general funds receipts in March 2019 of $275 million over March 2018. The General Assembly will study this report carefully as they continue their FY20 budget work. The COGFA report was published on Wednesday, April 3. State law requires a two-stage program to be carried out every year to organize, and prioritize, the capital infrastructure work of the State of Illinois. This includes spending on roads and bridges, mass transit, school buildings, university buildings, and many other categories. In the first stage, the Governor’s Office of Management and Budget (GOMB) prepares an overall capital spending plan, which looks closely at spending needed in the approaching fiscal year, but also pays attention to the State’s capital spending needs over the next five-years. In the second stage, the nonpartisan Commission on Government Forecasting and Accountability (COGFA) scrutinizes the Governor’s plan and looks at how much capital the State is likely to have available in the approaching fiscal year and over the next five years. COGFA then advises the General Assembly and its members whether the State’s capital resources will be sufficient to meet the needs identified and prioritized by GOMB. The COGFA report “FY 2020 Capital Plan Analysis,” published last week, adds to the growing evidence that Illinois is going to need to raise additional resources soon to meet its need for capital spending. This is particularly significant with regards to road and bridge maintenance and upkeep. Starting on page 51 of the CGFA report, analysts point out that the State’s motor fuel tax rate has remained at 19 cents per gallon since 1991. In Illinois, there have been no increases in this tax rate even as all of the expenses associated with transportation have increased. Since 2013, however, 29 states and the District of Columbia have responded to the same cost pressures by enacting motor fuel tax increases. These increases are structured in different ways across many of the states, but in each case these tax increases have led to rates that average much higher than the tax currently charged in Illinois. Across the 29 states + D.C. enumerated by COGFA staff, the average motor fuel tax is 32.23 cents per gallon for gasoline/gasohol and 34.84 cents per gallon for diesel fuel.